One of my favorite things to do with a big group is play minute to win it games, inspired by the Minute to Win It game show! They’re what we played for our Christmas party games and are planning to play again with different games and a different group of people for New Year’s Eve next week. 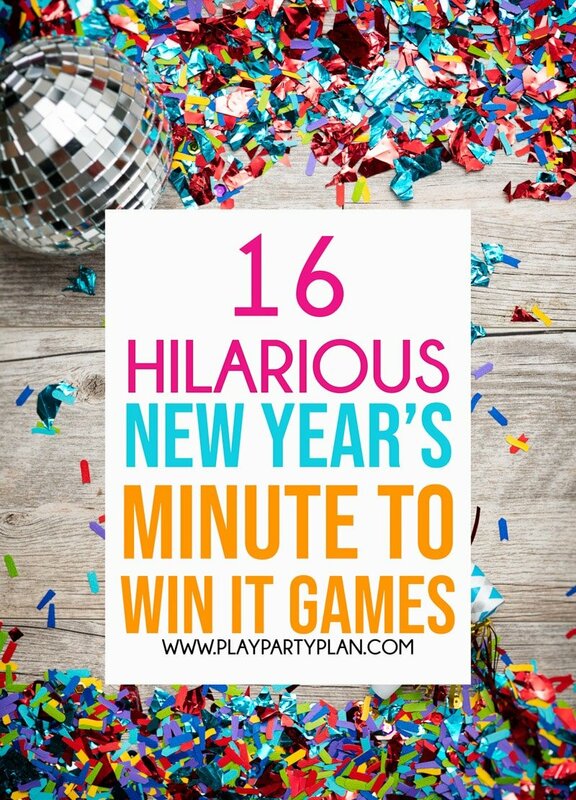 You could try out one of these games New Year’s Eve games or play them all, whatever works for you! Note: If any of these challenges seem to easy or too hard for the group you’re playing with, feel free to adjust slightly. For instance, if you have an extremely coordinated group for #1, make them catch 10 or more. If you’re going to play all of these games, here are all of the things you’ll need to play that you might not already have at home. 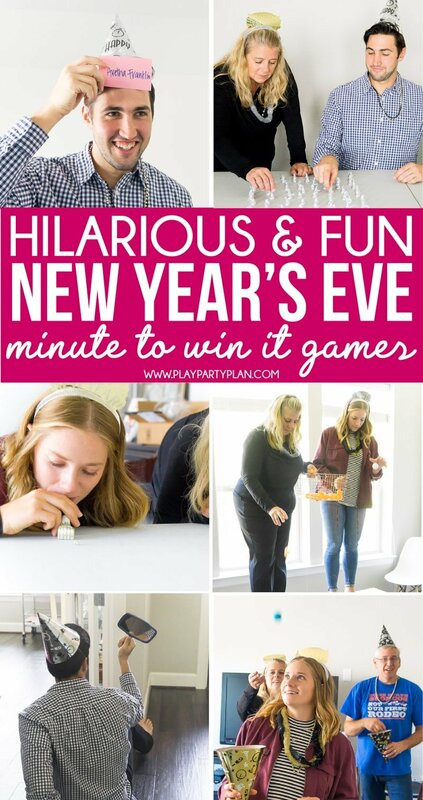 And if these games aren’t your style, check out these printable New Year’s Eve games I made just for this year! Or these 20 other New Year’s Eve games – I’m sure there’s something for everyone in this list! Watch the video below for a quick look at how fun these games really are! 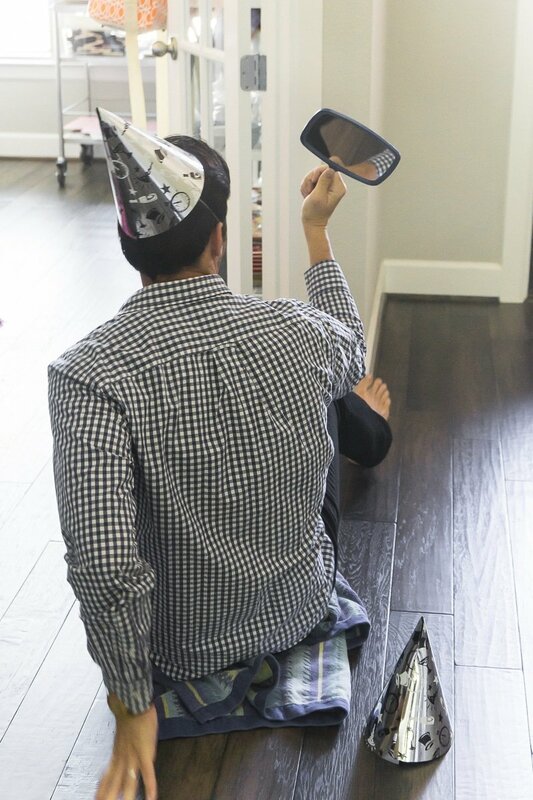 and give the other player (from the same team) a New Year’s Eve party hat. 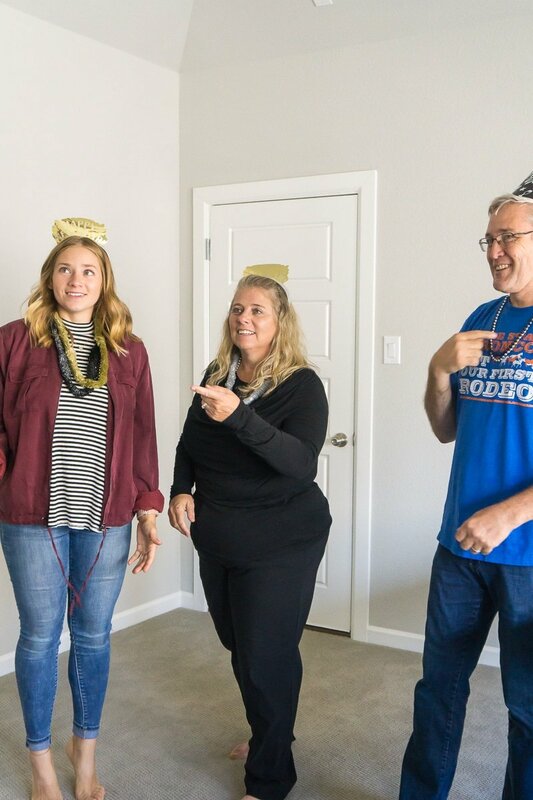 For the game, player 1 must stand behind player 2 and toss cotton balls or pom poms over player 2’s head. Player 2 must try to catch the pom poms without turning around and looking back and their teammate, just by stretching and reaching to catch the poms. First team to catch five first wins. Put all of the numbers in a large bowl. Put the bowl with the numbers in the middle of a table. Put four smaller bowls at the four corners of the table if it’s a large table or put them in four places around the room. Assign each bowl a number – 1, 2, 0, or 8. Player must sort the numbers in the large bowl into the smaller bowl within the time limit selecting only one number at a time and they MUST sort the number they selected (can’t put it back to do all 1s, all 2s, etc.).
. You can see this game in action in my kids New Year’s Eve party here! , or anything else that you could use to toss a ring around. and have them stand behind a line you create with masking tape. 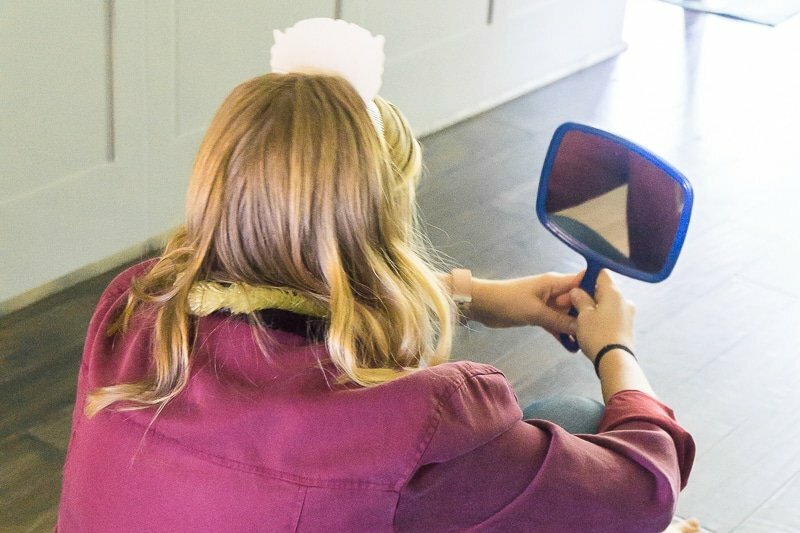 Players have to toss tiaras from behind the line to try and ring the tiara around the cone or stick. Player must ring three tiaras in the time. Write down a list of celebrities who were in the news a lot during the year. 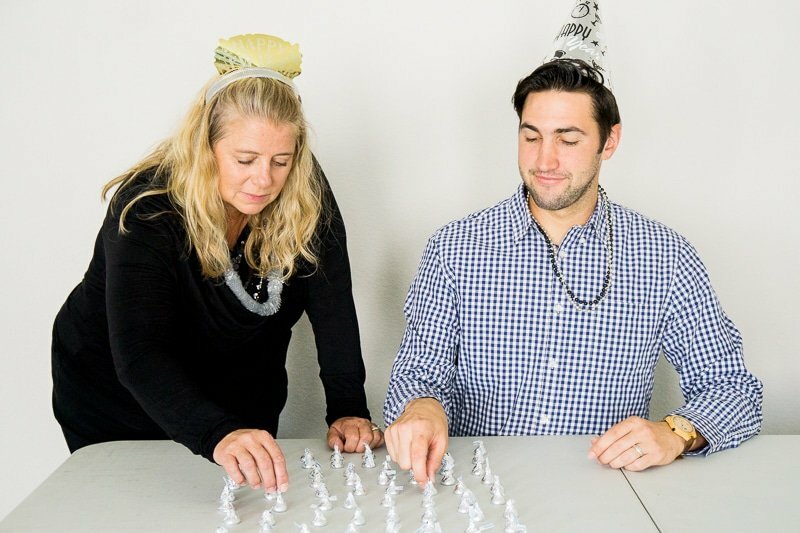 If you’re stuck, check out these New Year’s Eve trivia games and just grab the names from each of the games. and their team must give them clues (no names) to get them to guess the celebrity on their forehead. Once they’ve guessed the celebrity, they can move on. Player must guess five celebrities correctly in the minute or whoever can get the most correct in a minute. into a bowl (or cup) on the ground behind the chair. Player must successfully land three ping pong balls into the cup (without it bouncing out) before the time expires. 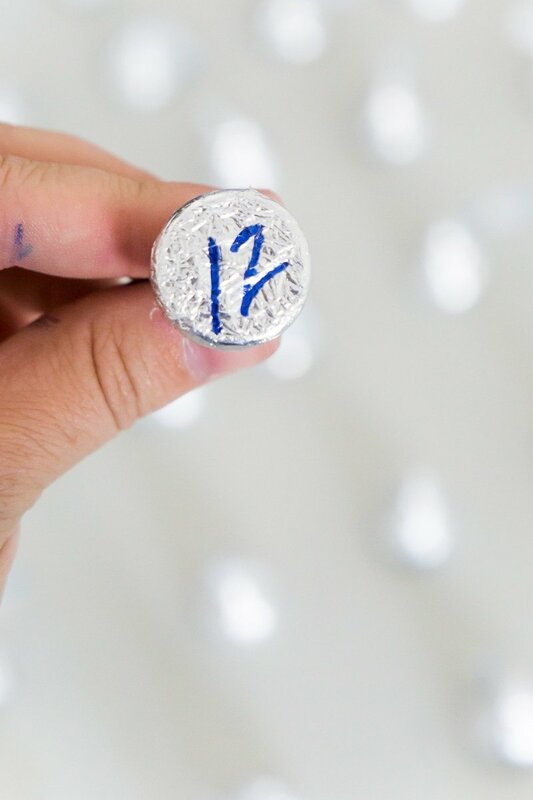 Supplies: Chocolate kisses, stickers or tape with the word 12:00 on them.
. For this game, lay out 50 chocolate kisses, including the five with the 12:00 on the bottom, on a table with the bottoms facing down. Player must go through and select one kiss at a time, trying to find one with a 12:00 on the bottom. If it has a 12:00, they are done. If it doesn’t have a 12:00, player must eat the chocolate kiss before choosing another. 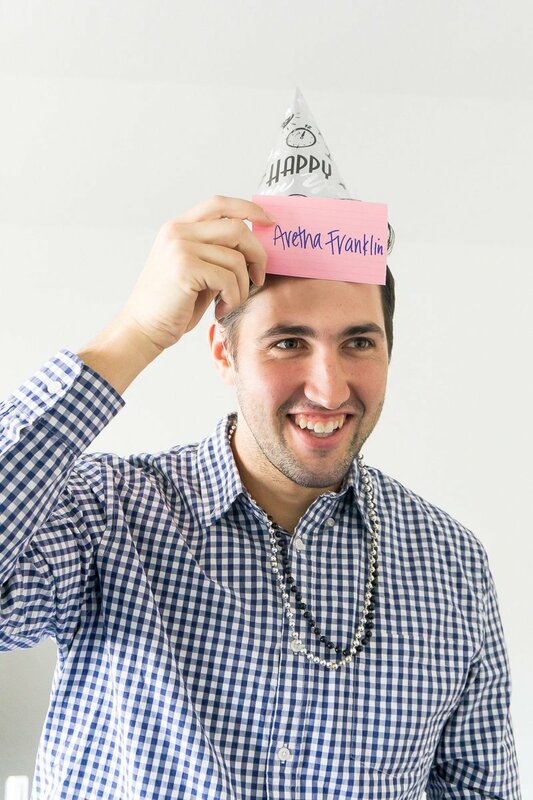 per player and write a typical resolution on each of the balloons (e.g., lose weight, work less, meal plan, etc.). 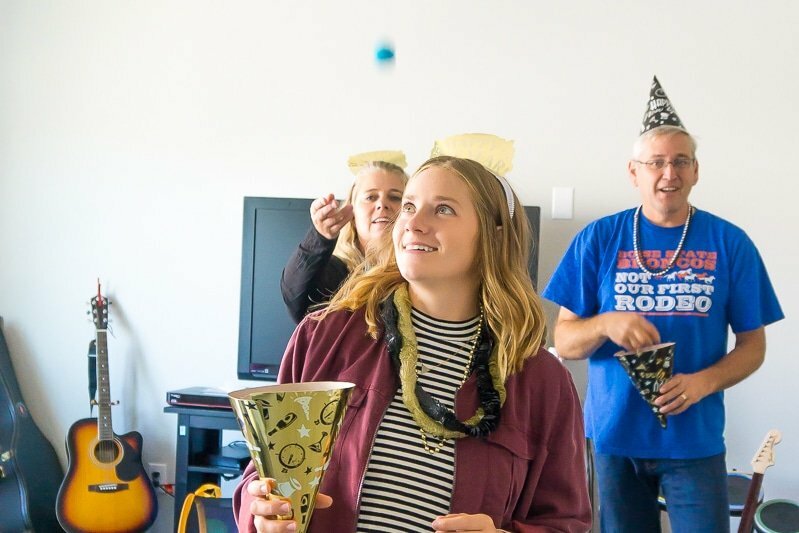 Player must keep the three balloons in the air for the full minute to win or time how long they keep them up and the person who keeps them up the longest wins. This game works best in a large space if you’re playing with multiple people at once or have one player play at once. If you’re going to have multiple people play at once, I recommend using different colors. , 10 in one, 9 in one, 8 in one, and so on so every box has a different number of jingle bells in it. Player must shake the boxes and put the boxes in countdown order (10 to 1) based on how many bells they think are in the box – 10 on the left and 1 on the right. Player must finish ordering in a minute and get it correct to win. or other boxes that have tops you can just take off so you can reuse them again and again. Set up an obstacle course of objects like cones, toys, confetti poppers, etc. on the ground from one line to another. Player must scoot themselves on a towel from the start line to the finish line going around the objects and then back from the finish to the start line to complete the challenge. and scoot backward using just what they see in their mirror reflection to move. like these ones would be perfect. at the table and attempt to knock off all the party hats before the time runs out. 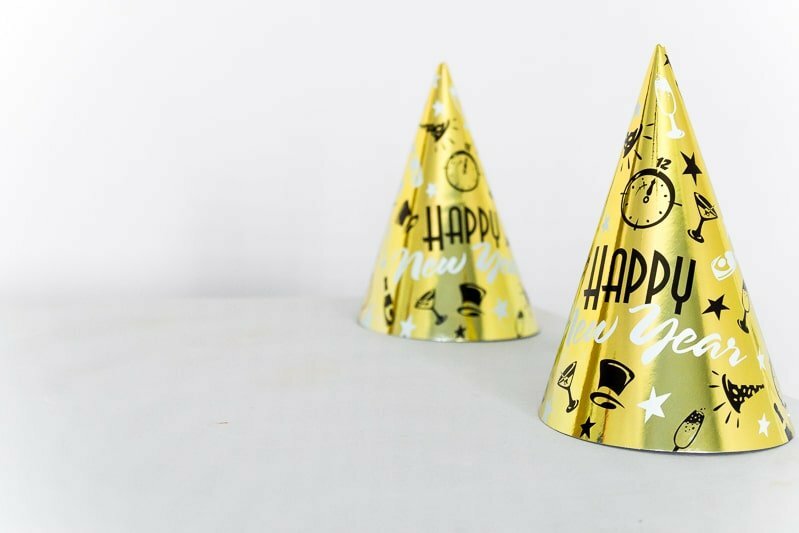 Use party hats that are nice and light. 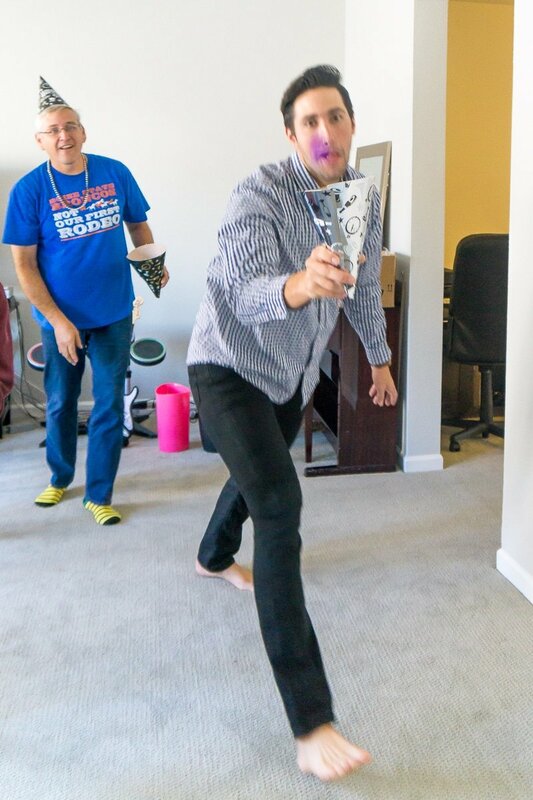 Players must stand facing one another (can stand as far apart as they’d like) and must make their way from the starting line to the end line by passing the ping pong ball from one person to the other, tossing it (NOT dumping it into the other person’s glass) from one glass and catching it in the other glass. (No hands allowed except for holding the glass). Players can move as much as they’d like down the path each play but if the ball drops at any point, the team must start over. 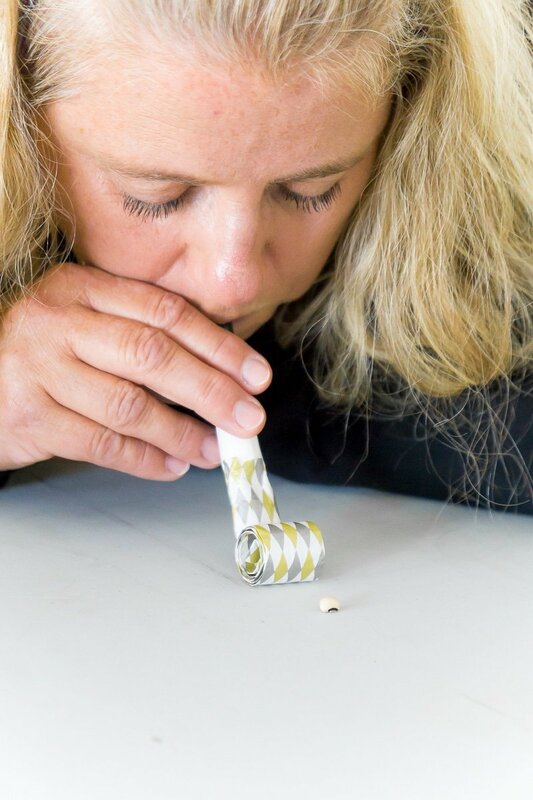 to blow a dried black eyed pea from one end of a table to the other. First person to knock off their black eyed pea wins. 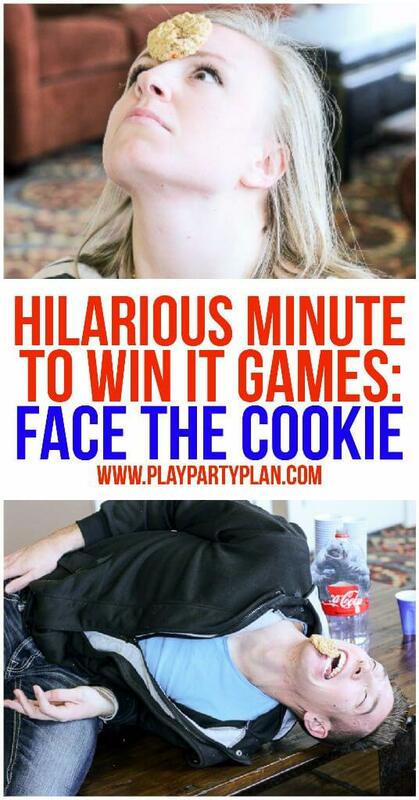 on their forehead and to win the game, must move the cookie from their forehead to their mouth without using their hands. If a player drops the cookie on the ground, pick it up and try again. If the cookie breaks, get a new cookie and start over. 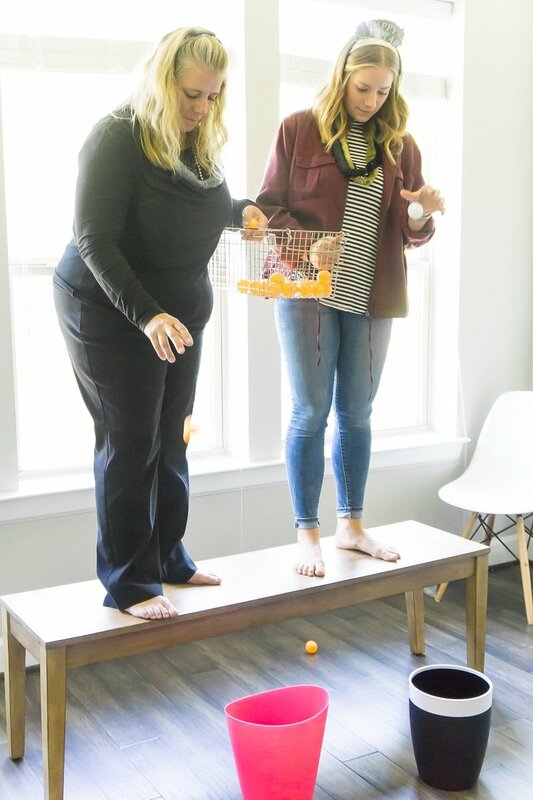 Player must shake their booty to get all of the ping pong balls out before the time runs out. 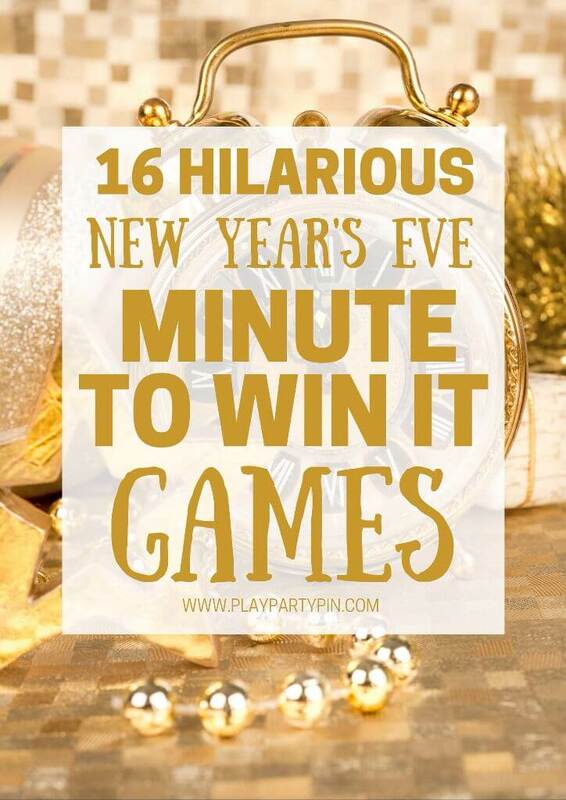 Don’t forget to pin these New Years Eve Games for later! Sands of time is such a creative minute-to-win-it game! Do you have 2016 game cards available yet? Great parties require great planning. Not yet Cathie, I typically wait until October so that I can include as many events from the year as possible. And I agree, great parties require great planning! If you subscribe to my email newsletter, you’ll know when I post them! i likes the hershey kiss game fir new years eve! so many awesome game ideas good for both kids and adults! I’m excited to try them this year! THANK YOU!